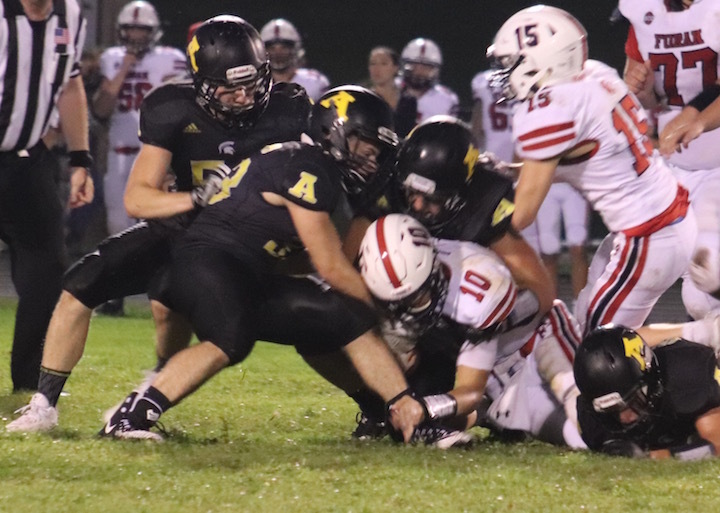 The Amity Spartans Football team hosted the Foran Lions in Woodbridge on Friday night. The humid, yet cooler temperature out in Woodbridge Friday night reminded everyone that it’s football season. The stands were full, and the Amity Army had a black-out in the far right of the stands, while on the track the Amity Cheerleaders shared their space with the award-winning Pop Warner cheerleaders, and the Amity Dance Team was on fire. Out on the field, the Spartans and the Lions went head-to-head, and Foran was first to score closing out the first quarter at 6-0. Foran continued to dominate with another touchdown and a successful 2-point conversion making their halftime lead 14-0. The Spartans scored in the third quarter and made a 2 point conversion, and the Lions made another touchdown and the kick was good, bringing the score to 21-8. No one scored in the final quarter and Foran boarded their bus with a 21-8 victory.